Deborah Naulls Agency is pleased to announce the formation of a master charity drive in the greater Dallas area inviting support from the agency’s network of professional partners and clients in benefitting the local community with a new charity initiative every 90 days. The inaugural campaign partners with nonprofit Dare to Dream Children’s Foundation to provide education, inspiration and mentoring programs for at-risk youth in group homes, shelters and detention centers in an effort to help kids overcome their wounds and live out their full potential. The Dare to Dream Children’s Foundation inspires us to look beyond labels and to help bring out the best in people. We are moved by the lives Jan has been able to change and save. Deborah Naulls Agency has announced the initiation of a master charity drive to strengthen the Texas communities they serve. The full-service insurance and financial services firm pledges to select a new beneficiary every 90 days, working closely with nonprofit organizations and community leaders to seek out those who most need help. Their hope is to bring greater awareness to important local causes by forming targeted campaigns which aid worthwhile organizations, families and individuals. To debut the new community involvement program, Naulls has chosen to support Dare to Dream Children’s Foundation, a nonprofit organization which offers aide to meet the emotional and spiritual needs of the state’s at-risk youngsters. Trained volunteers educate, inspire and mentor kids in group homes, shelters, detention centers and orphanages, helping them to overcome wounds of the past and go on to live out their full potential with positive and fulfilling lives. 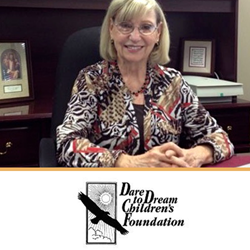 Founded by Jan Tennyson in 1987, a foster child herself, Dare to Dream has been awarded the Texas Governor’s Lonestar Achievement Award in 2007. Each donations page will be accompanied by a detailed story outlining the current cause and the team at Deborah Naulls Agency will work to spread the word through its own network of customers, business associates and friends. The agency also produces a monthly publication, Our Hometown magazine, which will use a full page to highlight each selected Community Cause. The electronic version of the current issue may be enjoyed at http://deborahnaullsagency.com/magazines/. To learn about the innovative ways Deborah Naulls Agency has developed to make it easy to help Dare to Dream Children’s Foundation and Texas youth, readers may visit http://deborahnaullsagency.com/causes/helping-youth-positive-future/ and are invited to share the page with their own personal and professional networks. ‘Serving Texas’ is their motto, and serve they do. A full-service insurance and financial services provider dedicated to helping families and businesses from offices in Lancaster, TX, agency owner Deborah Naulls knows many local families. This knowledge and understanding help her to provide customers with an outstanding level of service. Naulls and her team of caring professionals work diligently to help families protect the things which are most important to them – their families, homes, businesses, cars and more. They also prepare strategies to help clients achieve long-term financial goals. More information about the agency is available at http://deborahnaullsagency.com/. To speak with one of their expert agents, please call 972-227-7149.